If your bat has broken or been damaged and you are unsure what to do, then first contact the person/distributor whom you bought it from. If they can’t assist you then you are welcome to contact us directly. 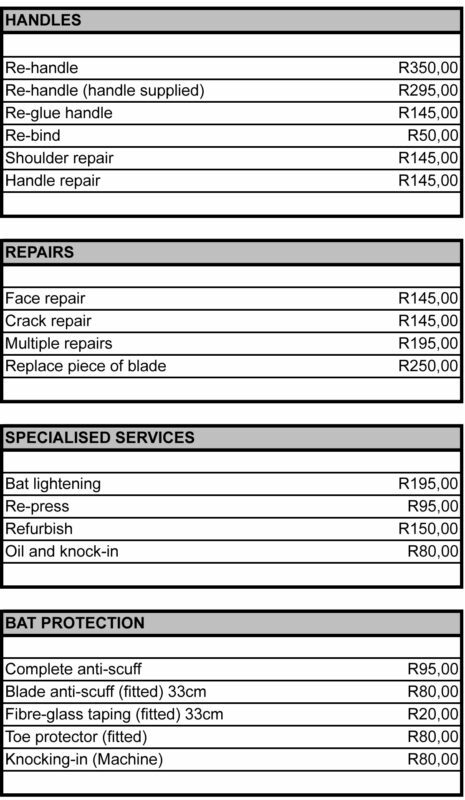 Unfortunately, we are unable to give advise on bat breakages or damages without physically assessing the bat concerned. Our workshop will gladly assist with repairs on and refurbishment of all brands of cricket bats. Courier costs for customer’s own account. Postage costs for customer’s own account. Fibre-glass taping & anti-scuff application is included free of charge with the cleaning of a bat face. An extra charge will be added to clean up bats which have been over oiled, covered with taping or generally ill-treated. Goods not collected within 90 days will be sold to recover costs. Emergency services are available at double the normal rates. We accept EFTs, credit/debit cards and cash.